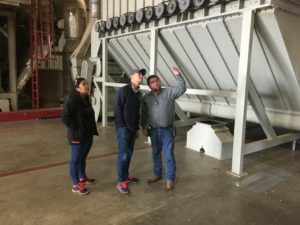 This past week, the California Cotton Ginners and Growers Associations (CCGGA) brought Assemblyman Evan Low (28th Assembly District) to Dos Palos Coop, a cotton gin near Dos Palos. The visit was part of a tour by the Agricultural Presidents’ Council (APC). Gin Manager Mike Davis was the site host where Assemblyman Low saw first-hand how upland and pima cotton are ginned. Assemblyman Low saw both a saw gin and a roller gin. Many topics were discussed including increased automation due to the impact of the increase in minimum wage and the overwhelming regulatory pressures faced by industry. Assemblyman Low represents the 28th Assembly District, located in the Bay Area and representing such cities such as Campbell, Cupertino, Los Gatos, Monte Soreno, San Jose and Saratoga. The tour is part of the Association’s continuing effort to inform and educate urban legislators on the challenges of operating and doing business in California. Other sites visited included an almond processor, dairy processor and a tomato processing plant. Representing CCGGA on the tour was President/CEO Roger Isom. This entry was posted in NEWS & ISSUES on November 22, 2016 by ccgga.